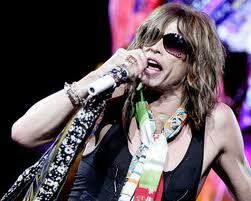 I would like to be best friends with Steve Tyler. Or, I would really just like to kiss him. I find the size of his mouth and lips so fascinating. They are just so large. As far as I know, this has not been passed on to the fruit of his loins. It is just so fascinating. I became interested in him when Aerosmith and Run DMC remade Walk This Way. I decided that when I became a hugely famous rock star, I would put three yards of material strips off my mike. But I would use more floral prints. I was a very shy, quiet high school student and Aerosmith seemed to be a good way to rebel. Perhaps those feelings have continued to exist until this day. And I do have three yards of fabric strips, but I made a quilt out of them. I am so badass. And I bet Tyler would be fun to hang out with. He wouldn’t BBQ like James Taylor, but I bet he knows where to go get burgers that are delicious. I have a feeling they are soaked in Jack Daniels before cooked, but I have had Jack Daniels steak and it has been really good. And I bet he knows where really good fries are to dip in the excess Jack Daniels. AND good places to buy silver jewelry. I wonder how hard it is to get ketchup out of the eye sockets of skull rings. I would also like to see how he decorates. Are microphones the only things he uses fabric swatches for? Does he have torn curtains? Are his table clothes really just ripped fabric sewn together? How did the microphone thing start in the first place? So I would like him to invite me over for some burgers purchased from a greasy diner and see how he sets the table. I bet there are skulls as the base of his utensils. And I bet he uses big huge goblets. For some reason I envision him in a sort of medieval dining setting with a large order of fries. Who does not want to be best friends with this man? I think Liv has lucious lips…but really…I always thought it would be fun to wear those huge addidas shoes that Run DMC wore…being badass would be a snap with those.